The hottest round of the 2015 Formula Drift season brought us to an entirely new track, with only a few turns the track made up for numbers with size. For the past few years Round Three has been held in Palm Beach and Miami, but this year the series took on Uncharted Territory at Central Florida’s Orlando Speed World, set up in a classic figure-8. The old adage goes that in Florida, when you just start getting used to the weather, it will change. 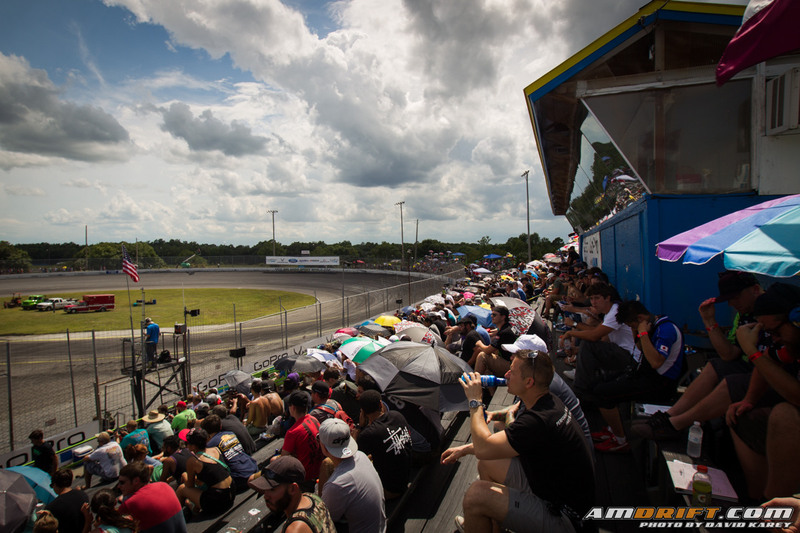 That was no exception for the first round of the Formula Drift Pro 2 Championship at Orlando Speedworld June 5-6, 2015. While the second tier drivers qualified in the dry, Mother Nature had other plans and would test the skills of newcomers and veterans alike. It would also be the first test of a brand new track for the Formula Drift Championships. While you’d like to think those with years of experience would end up on top, turns out the rookies would have something for them, and a driver that earned his license in a series that never experienced rain would take the win. Orlando Speedworld is not a venue new to drifting. It actually holds regular events that guys like Pat Goodin, Chelsea Denofa, Alec Hohnadell, and others in the state of Florida have driven on. So, it’s not hard to expect drivers like Kelsey Rowlings to make it into the Top 16. However, drivers like Alex Youe, Pat Cyr, Kasey King, or even Kenji Yamanaka would be names from outside of Florida you’d also expect, but you’d be left scratching your head as they did not make it. Pat crashed while Kasey experienced car troubles, and Kenji just didn’t perform as we expected him to. Instead, we found names like Andrew Gray, Faruk Kugay, Brody Goble, and number one qualifier Alex Heilbrunn on the list. However, that number one qualifier shouldn’t be much of a surprise, as two of the five rounds of the Just Drift “Top Drift” series are done on ovals similar to Orlando Speedworld, though the “whoops” section in the middle was probably a new experience. Same goes for Brody Goble who drove in the Evergreen Drift Series, which ran exclusively on the Evergreen Speedway oval that Formula Drift will see after New Jersey.